Bishop Kevin Dowling, Catholic Diocese of Rustenberg. Stephen Sackur talks to the South African Bishop prepared to defy the Vatican over the use of condoms and the fight against HIV/Aids. Every day in the shanty towns surrounding Pretoria Bishop Kevin Dowling actively defies Pope Benedict XVI and the rulings of Vatican. He does this by giving out condoms. 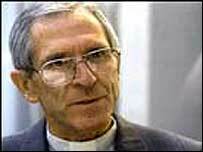 Bishop Dowling's parishioners are typical of the poor and uneducated of South Africa. They are the section of society most likely to contract HIV and the least equipped to deal with living with Aids. Stephen Sackur asks Bishop Kevin Dowling how does he justify his actions to his superiors? HARDtalk can be seen on BBC World at 0430 GMT 0930 GMT 1430 GMT 1930 GMT 0030 GMT. It can also be seen on BBC News 24 at 0430 and 2330.